Keep up to date with everything that’s going on at Sinai Youth. All in one place. On Friday we went to the see the Bar Kochva caves where Bar Kochva and his students hid during the time that they were, yet again, persecuted by the Romans. We got the chance to go crawl inside the actual tunnels but some of us didn’t want to due to the tight, small size of the caves. While we were waiting outside for those who had gone in we bumped into BA tour and saw some of our friends. 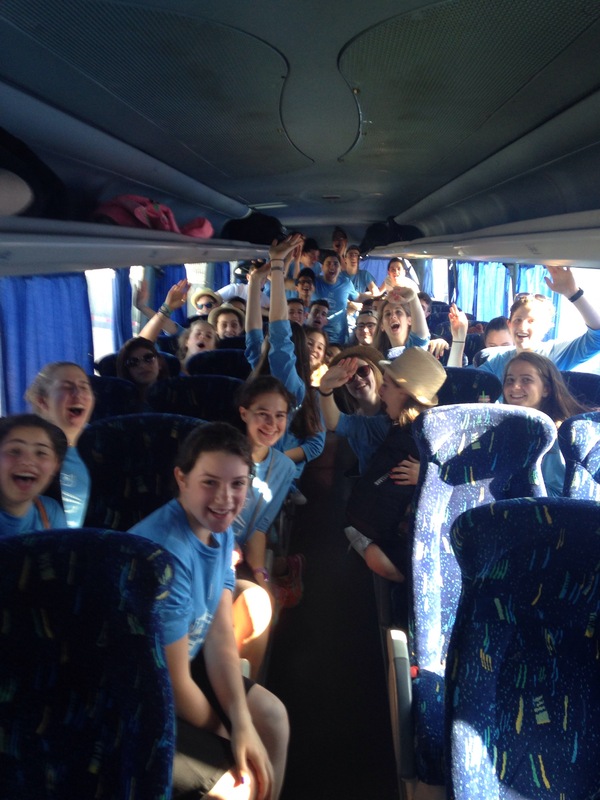 After that we got free time in Machane Yehudah for lunch and then headed back to the hotel to prepare for Shabbat. We drove to the kotel for Friday night davening which was really an experience of a lifetime. Sinai girls, chasidim, reform and even non Jews came together creating the most unbelievable atmosphere with a huge audience. Although we didn’t speak the same language, the Israeli songs connected us. While it may still be the three weeks, that didn’t stop us from having a jam packed day 3. Going to Shmuel’s yeshiva in the gush and then going to see the bus stop where the three boys were kidnapped gave the day an emotional start. We then went to Oz V’Gaon – an area where a new yishuv will be built to commemorate the three boys. We dug out rocks and cleared land for building foundations to be built. This was mid day in the heat and all of us really felt like we could let out our frustration, not only of the losses of the three boys but all the tragedies that have happened in Israel. It was only lunch time and we had all felt like we had achieved something. We were rewarded with Shmuel’s achievement of finishing mesechet brochos, (the girls finally had some meat) and we were lucky enough to use the geological toilets provided! We were also lucky enough to go to Rabbi Shlomo Kimche’s apartment which overlooks the whole of Efrat, and that’s when he told us to “make your dream into a window”. After being given some refreshing ice pops , we made our way to a ropes course and zip wired over wonderful views. It wasn’t over yet though. We all loaded the bullet proof bus to brave our way into chevron. Mearos Hamachpela and walking through the streets really completed the day, with a perfect amount of fun and learning. It was a momentous time, the first time we woke up in the Ramada, our spirits were high. As we finished a delicious breakfast we gathered in the lobby to be briefed on the day ahead. The day began and we were to travel to Tel Aviv. The first activity of the day was a talk inside the building where the state was declared independent. The fascinating story of the declaration was retold in the room where it took place. The next stop was the Palmach museum. It was very interactive and was a wonderful way to learn about the bravery of the freedom fighters. To end a great second day, we visited Rabin square for photos and to learn about the ideological split and the way the murder of a Prime Minister shook the country. After a long, exhausting flight we arrived to Israel where we met the boys and our madrich Daniel. We all packed onto the tour bus for the first time feeling energised and excited for the journey to come. Straight from the airport we went to daven at a moshav and then had a bagel breakfast in a nearby park. After that we went on a segway tour at the tayelet where we saw the most breathtaking views of Jerusalem and beyond. There were a few slip ups on the way, and we were all ravenous for our first Israeli meal of falafel and pita. After this we headed to our hotel, the Ramada Royal Wing, where we were greeted with impeccable service and soon settled in to our stunning rooms. After a quick change of clothes we headed to the Kotel where we davened our first maariv which set the tone for all of our tefillos to come. This was followed by a quick educational tunnel tour which was enjoyed by all. We returned to the hotel and continued our night the way we would every night to come, have you ever wondered why groups followed by our shiur groups, each with a different madrich/a on the overall topic of shmitta. This was the end of a wonderful day but the beginning of a wonderful three weeks.